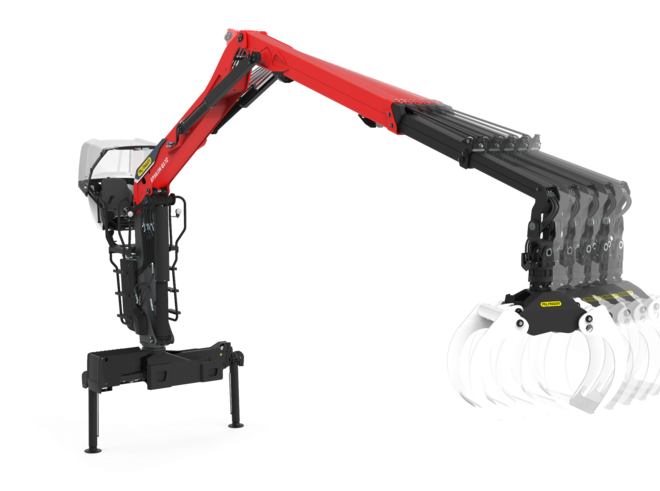 Thanks to Smart Control, the new boom tip controller, crane operation is easier, more intuitive and faster than ever. 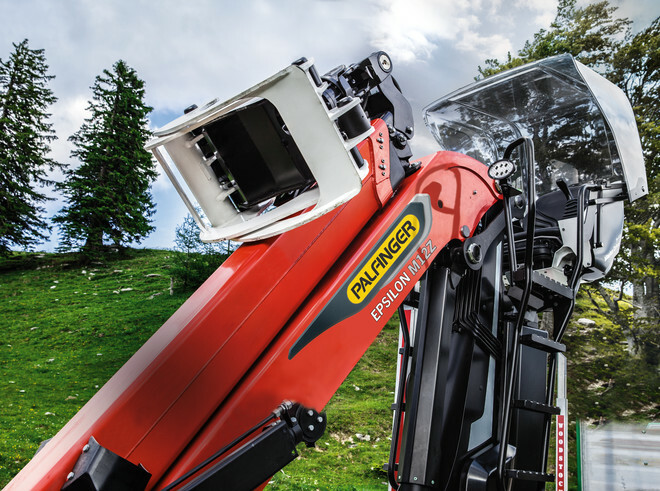 Crane operators no longer have to control each cylinder individually because now, thanks to the electronic assistance system, the operator can concentrate exclusively on the boom tip. 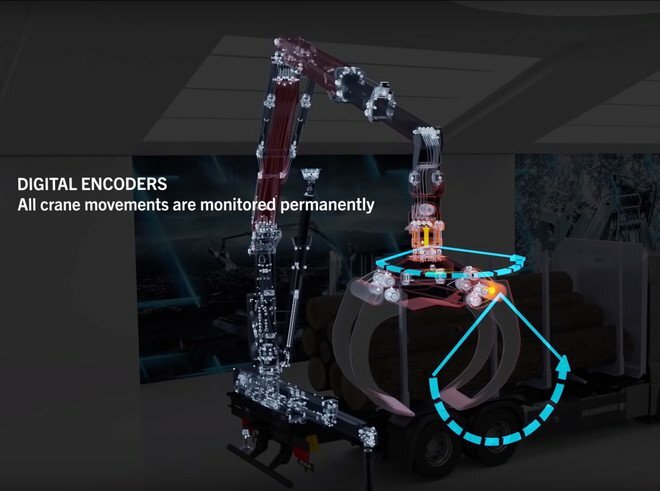 The new Virtual Drive – as a concept study, the virtual-reality (VR) control system developed by PALFINGER EPSILON offers some early insight into the control technology of tomorrow. A perfectly designed VR control system offers not only enhanced driver comfort and safety but also a range of additional benefits such as a better overview of the situation, additional loads and reduced fuel consumption. The benchmark for comfort and user-friendliness has been raised to a new level with the unique top seat from PALFINGER EPSILON. The Master Drive not only gives the operator full control for every job, but also enables extremely careful handling thanks to its sophisticated design and top-class technology. The ergonomic design of the mechanically suspended top seat ensures a high level of seat comfort, and all functions are immediately within reach with the multi-function armrest. The newly developed EPSHOOD crane operator protection system ensures optimum protection during work. The folding mechanism and technical thermoplastic keep wind, rain and sun away from the operator, guaranteeing maximum comfort every time. 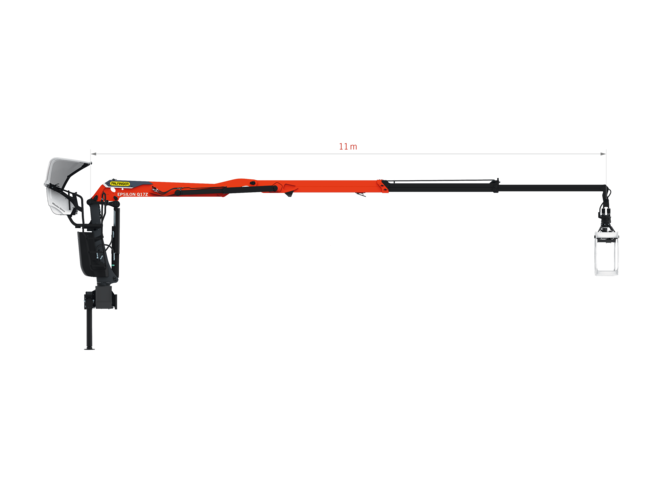 The crane speed of the Q-Series has also been improved significantly. Cranes in the higher lifting classes from 14 tonne metres upwards are usually much slower than smaller models. Not so with the new EPSILON Q-Series! Thanks to increased pressure and smaller cylinder diameters, it achieves a crane speed 15% higher. 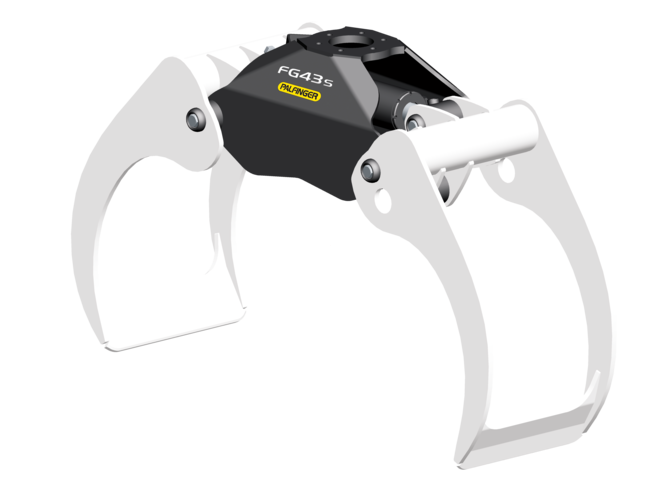 This means that customers can access maximum speed even at higher lifting capacities. 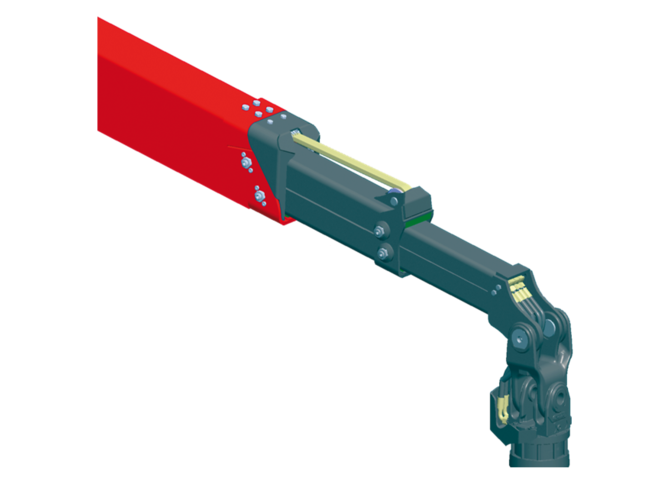 EPSILON has taken a fresh approach to the extension boom system with a protected, internal hose guide and internal telescopic cylinder! 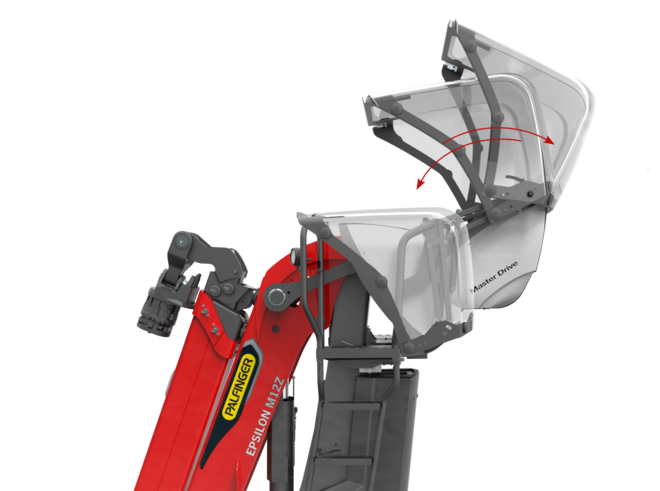 The new design of the double telescopic system for Z-cranes enables up to 1400 mm greater reach than the previous model. This means a total reach of an incredible 11 m.
The synchronous principle of the telescopic system ensures exceptionally high and constant extension speeds. As much as 300 kg lighter than its predecessor series. Thanks to the use of high-tensile steels combined with state-of-the-art, computer-aided simulation methods (3D and finite element calculations), it has been possible to reduce the unladen weight of the Q- and S-Series of the NEXT EPSOLUTION model range significantly – while making a number of key technical improvements. As almost 80 percent of the steel components are produced in-house, it can always be guaranteed that the material is only delivered exactly where it is needed. Millimetre for millimetre, component for component – at the highest level of quality. 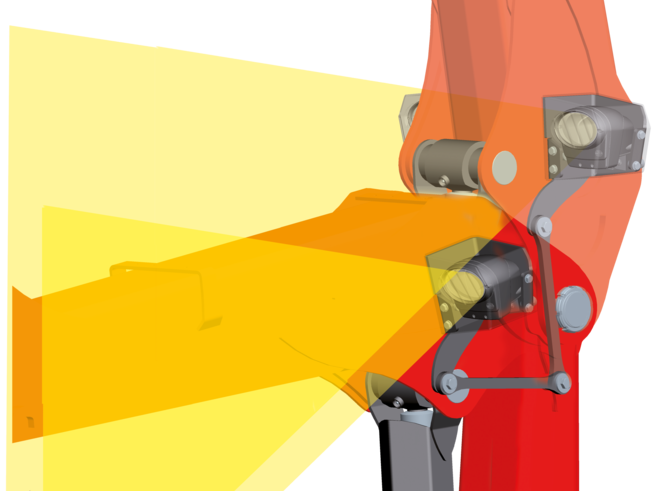 EPSILON's intelligent lights for forwarder cranes shine on the working area at all times thanks to the way in which they are installed on the lifting cylinder. This ensures that the available light is used to its fullest effect. 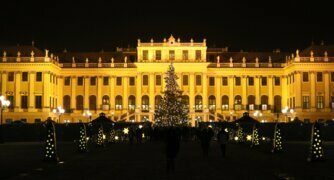 Thanks to the latest LED technology, the lights are much smaller and yet maintain the expected level of luminous efficacy. Furthermore, now that the lights are positioned on the lifting cylinder directly underneath the main boom, they are even better protected against damage. 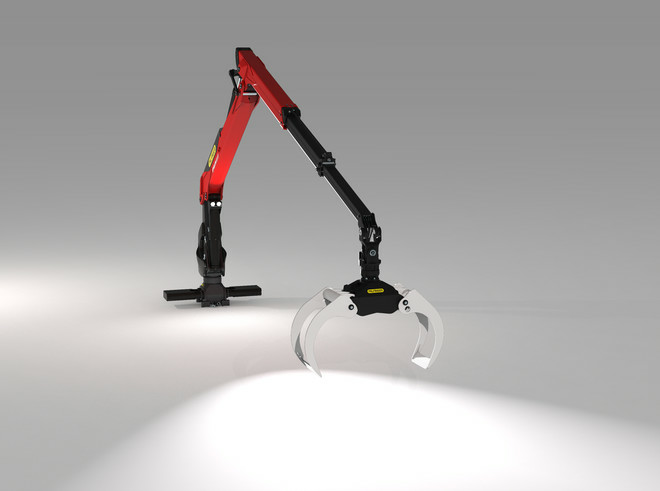 Three 1,000-lumen LEDs as standard – two on the main boom, one on the knuckle boom (three 2,600-lumen LEDs available as option). When it comes to ease of servicing and technical convenience, no crane manufacturer can hold a candle to PALFINGER EPSILON. 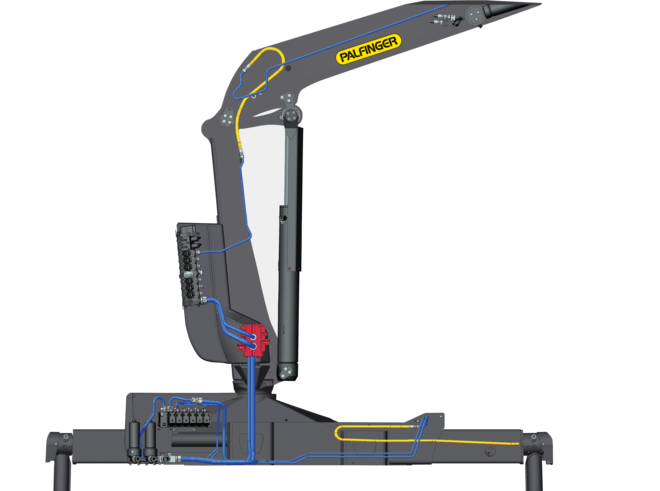 The unique design of the internal hose guide enables simple handling for the operator every time. In addition, the internal hose guide reduces the risk of damage to the hoses. Nevertheless, service openings on the crane make it possible to carry out any replacement work, which, in turn, saves time and money. 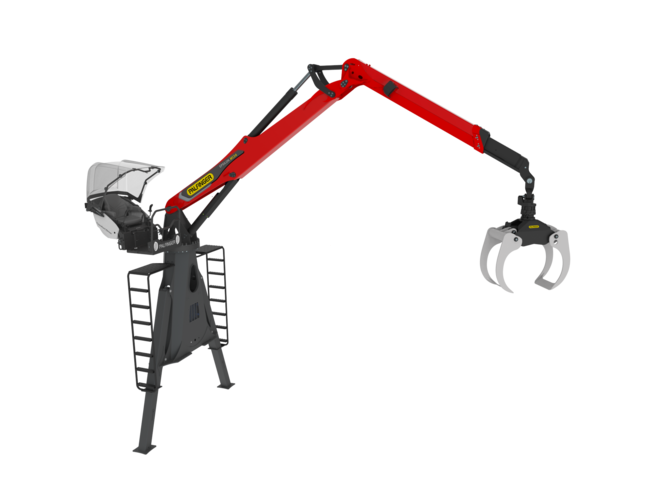 EPSILON's patented extension boom system with a protected internal hose guide and internal telescopic cylinder enables you to work safely without running the risk of mechanical damage to hoses on the outer boom. Weight is playing an increasingly important role in the world of professional timber handling. 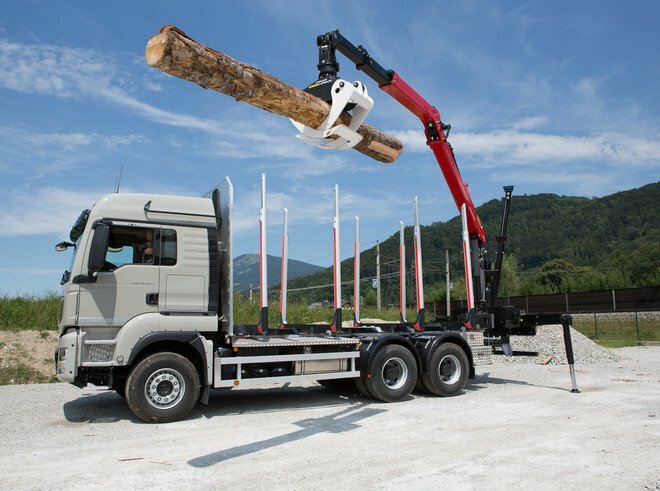 The commercial pressure on timber hauliers is on the up, and maximum loading capacities are constantly being tightened. 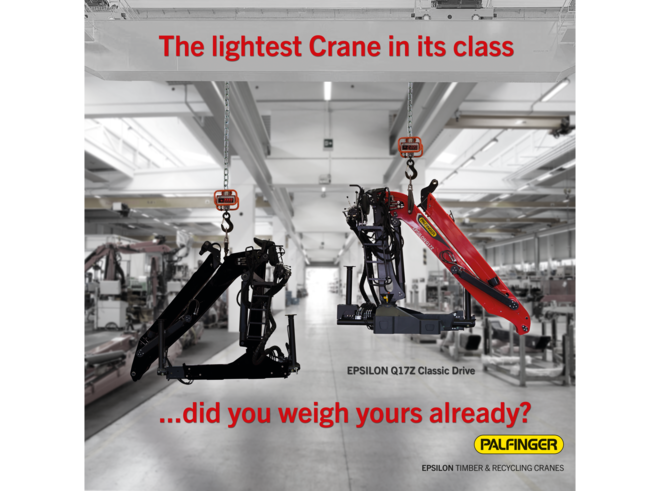 In keeping with the corporate objective of 'helping customers to achieve even greater success in their work', PALFINGER EPSILON wants to make a significant contribution to reducing weight for its customers. 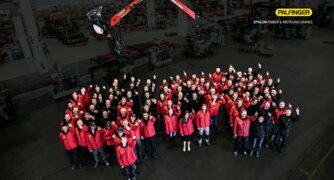 EPSILON is the first European manufacturer to develop an A-frame crane exclusively for the North American market in order to meet local needs even more effectively. The A-frame design, typical in North America, has been newly developed for local installers by a European company for the first time and given further improvements over the competition. As usual, however, the requirements of the operator were very much at the heart of this new development. 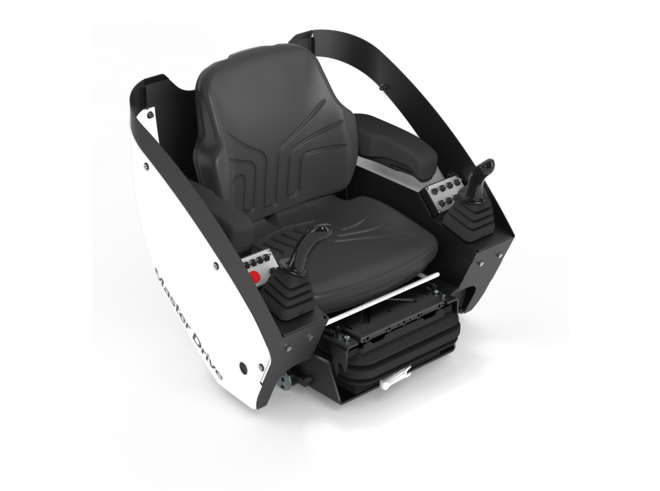 Consequently, with the Comfort Drive, a new crane command centre has been developed that redefines seat ergonomics and user-friendliness in the North American logger sector, especially in combination with the optional Cold Weather Package and EPSHOOD features. 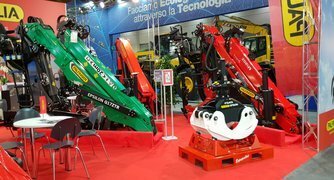 MADAL, based in Caxias do Sul (BRA), has been part of the global PALFINGER Group since 2001. To expand the existing product portfolio and respond to market demand, the Brazilian designers worked with the European engineers to develop a trailer that not only meets the needs of wood hauliers, but also most probably surpasses them. Challenging applications, difficult terrain and many hours of operation – typical features of forestry in Brazil. The new T12 forestry trailer – made in Brazil – is the ideal product for your application! It works hand in hand with the operator, productively and extremely safely. Using it equips you ideally to tackle the day-to-day challenges of working in the forest. Next Epsolution – this model range unites what belongs together! 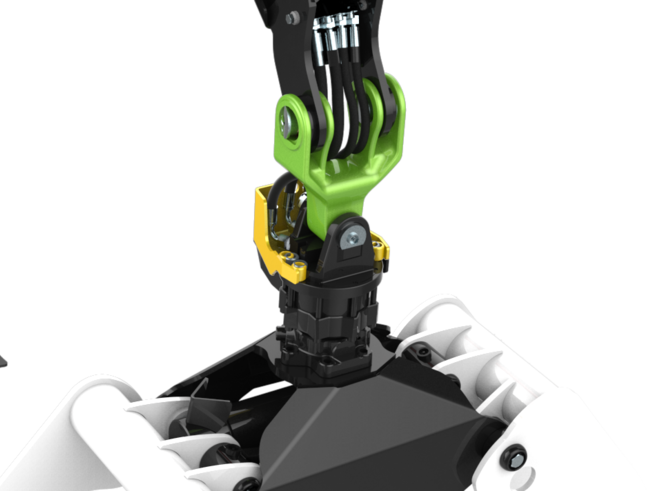 The NEXT EPSOLUTION model range has been developed from scratch in collaboration with industrial designers, test operators and highly qualified employees. This model range sets entirely new standards in terms of design. Enjoy total comfort as soon as you take your place in the tried-and-tested Master Drive seat and operate the multi-function command centre from the highest vantage point. The technology employed in the Q-Series will impress you right from the start when you notice how much your day-to-day productivity increases thanks to new reach and extremely precise control by hydraulic servo-controlled joysticks. 'E+P' stands for 'endless + protected'. 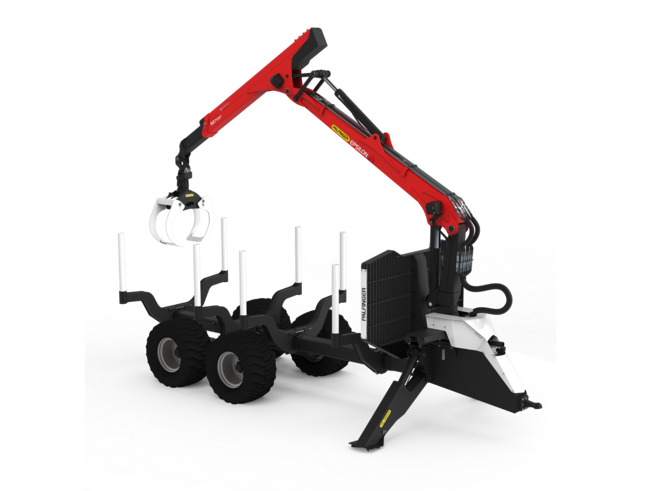 Thanks to a never-before-seen innovation in the form of a joint/rotator system that links the tip of the crane boom to the felling equipment, all hydraulic and electrical lines are routed internally for protection. This is intended to prevent the machinery from breaking down as a result of defective hoses or cables. 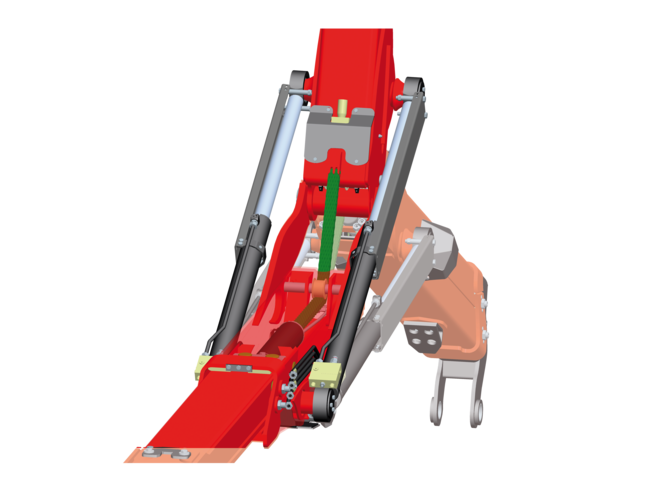 All you need to do is activate 'Raise knuckle boom' – EASYFOLD will do the rest! With Z-cranes, a stabiliser on the ground is normally required to bypass the dead centre of the outer boom ram. Not so with the EASYFOLD system from EPSILON (patent pending). 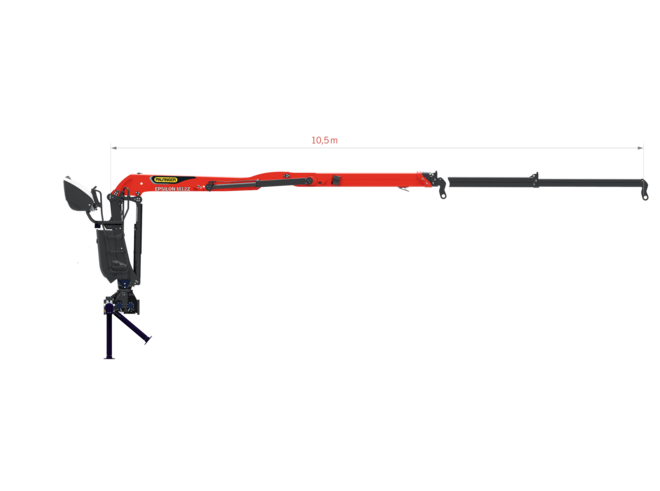 EPSILON's patented extension boom system with a protected, internal hose guide and internal telescopic cylinder enables you to work safely without the risk of mechanical damage to hoses on the outer boom. In addition, the reversed linkage opens up a much longer reach. EPSILON's intelligent lights for forwarder cranes automatically shine on the working area at all times thanks to direction control. This ensures that the available light is used to its fullest effect. 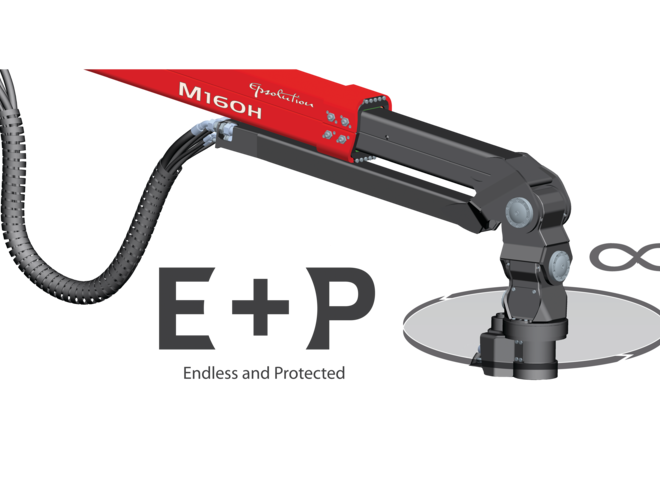 EPSILON's patented joint/rotator combination with an internal hose guide offers maximum protection during work for the hoses between the crane and grab. All EPSILON timber grabs come equipped with the latest sealing technology and ample bearing surfaces. Moreover, adjustable bolts and bronze bushings are used to prevent bearing play and ensure that the grab remains a precise tool even after years of operation.